Tennessee Chiropractic Association | Pedal Safe and Pedal Happy! Spring and summer bring longer days and more outdoor activity. Bicycling has been a popular pastime for children and adults alike. In recent decades, it has gained popularity as a sport as well as a means of transportation for commuters looking for a healthy way to avoid traffic delays. Still, riding a bike brings certain risks and there are important state and national safety precautions of which cyclists should be aware. The most common bicycling injuries are falls. Generally minor in nature, for most those little cuts and scratches heal fairly easily. However, more serious head injuries may occur from either a fall or a collision with another object or vehicle, and can be life-altering or even deadly. Obviously, when there is a collision with a motor vehicle and a bicycle, the most likely scenario is injury to the bicyclist. According to the National Highway Traffic Safety Administration, 840 bicyclists were killed in a traffic collision in 2016. According to Safe Kids Worldwide, biking accidents cause more children 8-14 years old to visit an ER than any other sport. Helmets can reduce severe brain injuries by 88 percent! Sadly, its estimated that only 45 percent of children 14 and under wear a helmet regularly. As Tennessee’s population grows, the number of motor vehicles and bicyclists on the roadway is also growing. Whether around the neighborhood or downtown to get to work, do you know how to keep yourself and your children safe while cycling? As always, prevention is best. There are a number of simple things you can do to be pro-active to keep yourself and those around you safe. Regardless of the season, bicyclist deaths occur most often between 6pm and 9pm. All bicycle operators under 16 years of age to wear a bicycle helmet on any highway, street, or sidewalk. All child passengers under 40 pounds or 40 inches to be seated and secured in a child restraining seat or a bicycle trailer. Also, a bicycle and a motor vehicle have the same legal status in Tennessee. Therefore, it is important to know the rules of the road before venturing out on your bike. ALWAYS wear a GOOD helmet THAT FITS properly! The helmet should sit on top of the head in a level position, and should not rock forward, backward or side to side. Safe Kids Worldwide has a Helmet Fit Test that the Tennessee Highway Safety Office recommends. Eyes: Put the helmet on your head. Look up. You should see the bottom rim of the helmet. Ears: Make sure the straps form a “V” under your ears when buckled. The straps should be a little tight but comfortable. In their “Children’s bike helmet safety facts: 7 Quick Tips” posted on My Southern Health, experts at Vanderbilt University Medical Center and the Monroe Carell Jr. Children’s Hospital at Vanderbilt note that there are safety standards for bicycle helmets. Look for the approval from the Consumer Product Safety Commission to verify your helmet meets current standards. If you need help selecting a helmet or getting it sized appropriately, check with your local bike shop. To increase visibility of the cyclist, you can add reflective stickers to the helmet. Similar to other safety gear like a car seat, if a helmet is involved in a crash, it should be replaced. Even if damage to the helmet isn’t visible, it may have been weakened and should be discarded. Because of this, BE CAUTIOUS when purchasing used helmets. Be sure the helmet is for bike riding. You can use the same helmet for a scooter, roller skating or in-line skating. However, a different type of helmet is needed for skateboarding and longboarding. Use a helmet ANYTIME you ride. While most serious injuries are on roadways, even riding in the backyard or driveway can be very dangerous. If the cyclist falls wrong, they could hit their head on pavement, trees, or other objects on the ground. While sidewalks are NOT recommended for general bike riding (motorists are less likely to be watching for a moving object on a sidewalk when pulling out, etc. ), for young children sidewalks are a good place to get used to riding near motor vehicles. During this phase, they should be accompanied by an adult and taught to be extra careful near driveways. Each child is different, but from a developmental standpoint, it can be difficult for children under the age of 10 years to accurately judge speed and distance of cars. Keep this in mind as you work with your child. 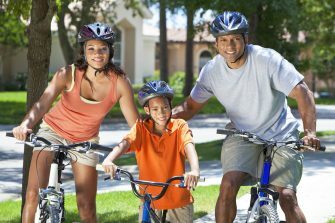 Overall, biking can be a fun part of your family’s active lifestyle. Pedal safe! Pedal happy!